The size of your bike plays an important role in the comfort and enjoyment of cycling. Bikes can come in several different frame sizes and geometries, each suited to a different person’s body type. That is why it is important you find a bike, which is suited to you. • Knee and back pain – These issues are common in a bike, which is the wrong height for the rider. Continuous use can lead to damaging long-term effects. 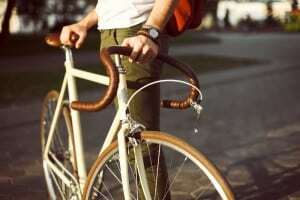 • Riding Discomfort – If your clothing is too small or too big, it would make day to day life frustrating. The same goes for bike sizes. If you ride a bike not suited to your height and arm span, you’ll find bike riding becomes difficult. • Poor performance – When you purchase your bike you can only achieve maximum pleasure if it is the right size. As you are now aware, it is highly important you choose the right sized bike for yourself. But how? Aspects that need to be taken into account when you buy a bike include your own height, your ape index (how long your arm span is compared to your height) and the length of your legs. Not sure how to get these measurements? Once you have chosen the style of the bike you would like, Hoffy Cycles will give you the right advice to ensure you choose the appropriate bike suited for you. We will adjust the bike, so that it is comfortable for you to ride. Get the right bicycle size and the best style of bike for your lifestyle and you’ll find cycling more pleasurable than it’s ever been before! Need more information about bicycle size fitting sessions? Contact the team at Hoffy Cycles today! If you would like a professional bike fit, we can arrange that for you in store. Please call Hoffy Cycles on (07) 3269 1213 to book your appointment!